Photography and Design needs? Request a quote! 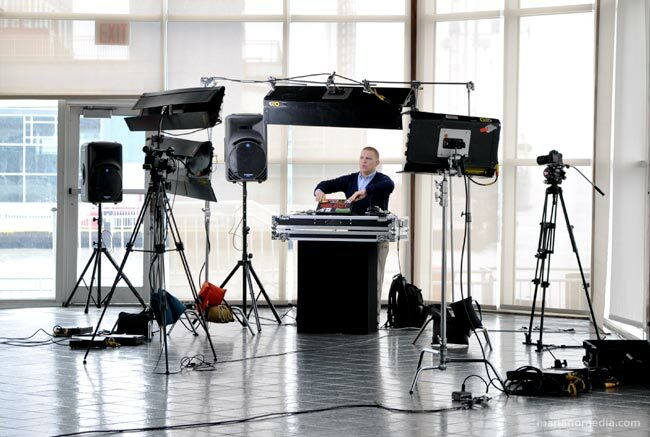 This month of May has been a busy one for the Scratch Weddings team as we just finished our photo and video shoot of our DJs at Gansevoort Hotel and The Lighthouse @ Chelsea Piers, NY. Featured in this photo is DJ Select, one of Scratch Weddings’ new DJs. I was assigned to photograph our DJ Talent and take their portrait shots on-location. On the actual photo shoot day, the weather wasn’t cooperating. It was a good thing that The Lighthouse – an events hall is covered and had interesting interiors to shoot with. The video crew was equipped with their day-light balanced lights. It was more than enough for still photography. However, i still had to deal with shooting in the other parts of the complex. I usually just carry a simple setup since i need to be mobile enough to shoot around. I had with me a couple of portable dedicated camera flashes with a shoot-through umbrella and reflectors. There were spots where it was dark, and some had diffused window light. So i just had to adjust accordingly depdening on the lighting conditions in the complex. The result – DJ Nire | DJ Furnace | DJ Merlin Things have been hectic in the office, but i will post a new gallery of the DJ profiles that i have documented during the past few weeks soon. Keep posted for my next update! © Copyright Michael Mariano 2011. All Rights Reserved. Marianomedia.com runs on WordPress Comments (RSS).